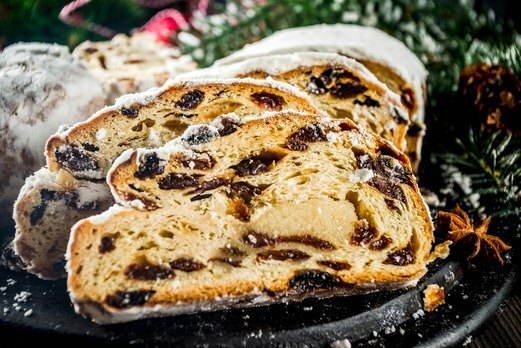 This fruit and nut sourdough bread recipe is a modification of the traditional German Christmas bread. It uses the principles of lacto-fermentation to neutralise anti-nutrients in the flour and nuts, and to predigest the proteins and starches, making the Stollen more digestible and nutritious. Makes one large flat loaf. Grated rind of one small orange. 1/4 cup cherries (fresh if possible). 1/4 cup almonds, flaked or chopped. 1 tablespoon port or sherry. 1/4 teaspoon Celtic sea salt. 1/4 cup honey or unrefined sugar (optional). 2 tablespoon melted butter, for brushing the stollen after it is baked. In a glass bowl mix together the spices, citrus rind, orange juice, kefir whey, cherries, almonds, raisins, rum and port. Cover with a tea towel and leave to marinate for 12-24 hours. Mix the flour and salt in a bowl. Rub in the butter with your finger tips until the the mixture forms the texture of bread crumbs. Mix in the marinated fruit and nuts, sourdough starter and optional honey or unrefined sugar. Make a well in the centre of the mixture and mix in the beaten egg. Turn the mixture out onto a floured benchtop and form into a dough. Knead, adding a little milk or flour, until the dough is soft and pliable. The fruit and nuts make it a little challenging to knead but persevere for five minutes or until the dough has a satin-like finish. Form the dough into a log and pat down into a flat oval shape about 10 inches long by 3 inches wide by 2 inches thick. Put the dough onto a greased and floured baking tray. Cover with a thin damp tea-towel and leave to proof (at 28-32C) until it has doubled in size (about 12-16 hours.) Bake in a preheated oven at 180C for 25-30 minutes or until a clean knife comes out dry. Brush with melted butter as soon as you remove it from the oven. If the weather is hot you may need to remoisten the t-towel periodically. If the surface of the dough forms a dry crust then it will prevent it from rising.